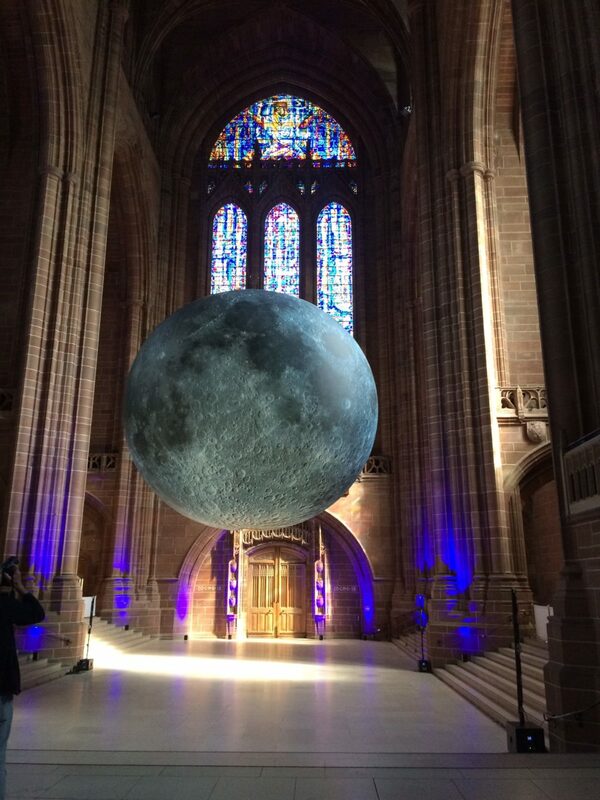 Suspended from the ceiling in the centre of the well of Liverpool’s Anglican Cathedral hangs Luke Jerram’s Museum of the Moon. Today, it is lit by the sun’s multicoloured rays, filtered through the stained-glass windows running along each side and the magnificent Benedicite window above Tracey Emin’s For You installation. Jerram’s installation is accompanied by a soundscape created by BAFTA and Ivor Novello award-winning composer Dan Jones. What is enjoyable about this installation is that it hangs well above eye level. You have to look up and you view it with the architectural details of the cathedral in the background which you may not have paid attention to had you visited the cathedral before. Bristol based, international artist Jerram, worked with a hot air balloon manufacturer to produce the seven-metre wide sculpture. 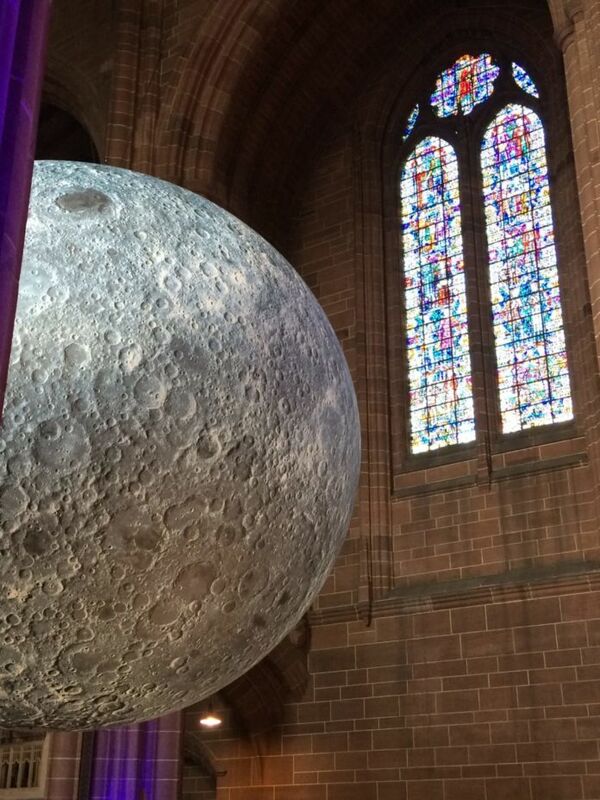 Lit from within and printed with the details of the surface of the moon on a 1:500 000 scale, it is mesmerising. On the very first trip I made to India, I arrived during Diwali. After a couple of days travelling, I landed in a village pretty much slap bang in the centre of India. On the first night of my arrival, I sat on the terrace of the house I was staying in. It was pitch black outside. Then, in the horizon, the full moon started to rise – an enormous, pale golden globe that lit up the sky and everything its rays fell on. I had this sudden awareness of how tiny I was in the face of the vastness of the universe. The memory has stayed with me since. I think this is what makes the Museum of the Moon such a successful installation. A full moon can affect us profoundly. Everyone at least one story to tell of a memorable experience beneath the rays of a full moon, or childhood memories of looking for the face of the ‘man in the moon’. Standing beneath the installation, circling it, taking in the landscape of its surface, a space is created for those memories to the surface. And Jerram has been collecting stories from the locations it has been installed in as the installation has toured the world. Every culture on the planet has its own unique relationship with the moon and tells it through its stories, myths, beliefs, songs and superstitions. Living in an urban environment in the twenty first century, sometimes it feels like we are removed from the rhythms and the cycles of nature. Luke Jerram’s installation is a wonderful reminder of it. 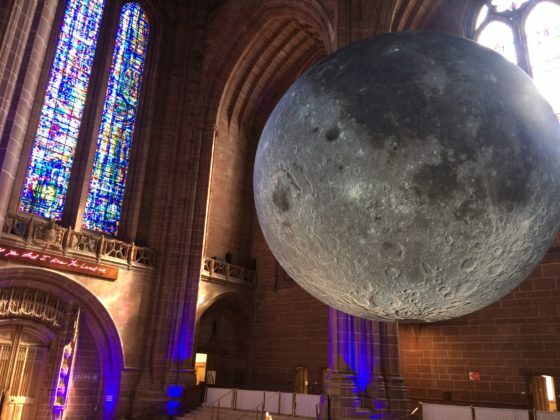 The Museum of the Moon is installed in Liverpool’s Anglian Cathedral as part of the Three Festivals Tall Ships Regatta 2018 festival over the bank holiday weekend of 25 – 28 May.